Jewish prayer (Hebrew: תְּפִלָּה, tefillah [tefiˈla]; plural Hebrew: תְּפִלּוֹת, tefillot [tefiˈlot]; Yiddish תּפֿלה tfile [ˈtfɪlə], plural תּפֿלות tfilles [ˈtfɪləs]; Yinglish: davening /ˈdɑːvənɪŋ/ from Yiddish דאַוון daven ‘pray’) are the prayer recitations and Jewish meditation traditions that form part of the observance of Rabbinic Judaism. These prayers, often with instructions and commentary, are found in the siddur, the traditional Jewish prayer book. However, the term tefillah as referenced in the Talmud refers specifically to the Shemoneh Esreh. Prayer—as a "service of the heart"—is in principle a Torah-based commandment. It is not time-dependent and is mandatory for both Jewish men and women. You shall serve God with your whole heart. However, in general, today, Jewish men are obligated to conduct tefillah ("prayer") three times a day within specific time ranges (zmanim), while, according to some posekim ("Jewish legal authorities"), women are only required to engage in tefillah once a day, others say at least twice a day. Additional prayer: Arvit (עַרְבִית, "of the evening") or Maariv (מַעֲרִיב, "bringing on night"), from "nightfall". Musaf (מוּסָף, "additional") are recited by Orthodox and Conservative congregations on Shabbat, major Jewish holidays (including Chol HaMoed), and Rosh Chodesh. A fifth prayer service, Ne'ila (נְעִילָה, "closing"), is recited only on Yom Kippur, the Day of Atonement. The Talmud Bavli gives two reasons why there are three basic prayers de-rabbanan ("from our Rabbis") since the early Second Temple period on: to recall the daily sacrifices at the Temple in Jerusalem, and/or because each of the Patriarchs instituted one prayer: Abraham the morning, Isaac the afternoon and Jacob the evening prayer. The Talmud yerushalmi states that the Anshei Knesset HaGedola ("The Men of the Great Assembly") learned and understood the beneficial concept of regular daily prayer from personal habits of the forefathers (avoth, Avraham, Isaac, Yaacov) as hinted in the Tanach, and instituted the three daily prayers. A distinction is made between individual prayer and communal prayer, which requires a quorum known as a minyan, with communal prayer being preferable as it permits the inclusion of prayers that otherwise would be omitted. Over the last two thousand years traditional variations have emerged among the traditional liturgical customs of different Jewish communities, such as Ashkenazic, Sephardic, Yemenite, Eretz Yisrael and others, or rather recent liturgical inventions such as Hassidic, Chabad, Conservative, and various Reform minhagim. However the differences are minor compared with the commonalities. Halachically, Jews can switch from one nusach tefillah to an other (and back) at any time, even on a daily basis, and are not bound to follow the nusach of their forefathers. Most of the Jewish liturgy is sung or chanted with traditional melodies or trope. Synagogues may designate or employ a professional or lay hazzan (cantor) for the purpose of leading the congregation in prayer, especially on Shabbat or holidays. According to the Talmud Bavli (tractate Taanit 2a), tefillah ("prayer") is a Biblical command: "'You shall serve God with your whole heart.' (Deuteronomy 11:13) What service is performed with the heart? This is tefillah." Prayer is therefore referred to as Avodah sheba-Lev ("service that is in the heart"). It is not time-dependent and is mandatory for both Jewish men and women. Mentioning tefillah, the Talmud always refers to the Amidah, that is also called Shemoneh Esreh. The noted rabbi Maimonides (RaMBaM) likewise categorizes tefillah as a Biblical command of Written law, as the Babylon Talmud says. However, corresponding with the Jerusalem Talmud, the RaMBaM did hold that the number of tefillot ("prayers") and their times are not a Biblical command of Written law and that the forefathers did not institute such a Takkanah, rather it was a rabbinical command de-rabbanan ("from our Rabbis") based on a takkanah of the Anshei Knesset HaGedola ("The Men of the Great Assembly"). According to Rabbi Jose b. Hanina, each of the Patriarchs instituted one prayer: Abraham the morning, Isaac the afternoon and Jacob the evening prayers. This view is supported with Biblical quotes indicating that the Patriarchs prayed at the times mentioned. However, even according to this view, the exact times of when the services are held, and moreover the entire concept of a mussaf service, are still based on the sacrifices. Each service was instituted parallel to a sacrificial act in the Temple in Jerusalem: the morning Tamid offering, the afternoon Tamid offering, and the overnight burning of this last offering. Rabbi Yisrael Meir HaCohen Kagan—the "Chofetz Chaim"—at prayer towards the end of his life. Rabbi Yehoshua said that the Anshei Knesset HaGedola ("The Men of the Great Assembly") learned and understood the beneficial concept of regular daily tefillot from the habit of the forefathers (avoth) Avraham, Isaac and Yaakov. Therefore, the Anshei Knesset HaGedola based their Takkanah that Jewish men were required to pray three times a day from hints to personal habits of the forefathers in the tanach. And Daniel, when he knew that a writ had been inscribed, came to his house, where there were open windows in his upper chamber, opposite Jerusalem, and three times a day he kneeled on his knees and prayed and offered thanks before his God just as he had done prior to this. Orthodox, Modern Orthodox and Sefardic strands of Judaism regard halakha (the collective body of religious laws for Jews) as requiring Jewish men to say tefillot ("prayers") three times daily and four times daily on the Sabbath and most Jewish holidays, and five times on Yom Kippur. Some of those movements regard the system of multiple daily prayer services within specific time frames as optional for women due to their need to be constantly taking care of small children, but—in accordance with halakha—they are still required to pray at least daily, without a specific time requirement. Moreover, it is generally accepted by Orthodox, Modern Orthodox, and Sephardic religious authorities that women are exempt from the evening prayer. Conservative Judaism regards the halakhic system of multiple daily services as mandatory. Since 2002, Jewish women from Conservative congregations have been regarded as having undertaken a communal obligation to pray the same prayers at the same times as men, with traditional communities and individual women permitted to opt out. Reform and Reconstructionist congregations do not regard halakha as binding and hence regard appropriate prayer times as matters of personal spiritual decision rather than a matter of religious requirement. According to halakha, all individual prayers and virtually all communal prayers may be said in any language that the person praying understands. For example, the Mishnah mentions that the Shema need not be said in Hebrew A list of prayers that must be said in Hebrew is given in the Mishna, and among these only the Priestly Blessing is in use today, as the others are prayers that are to be said only in a Temple in Jerusalem, by a priest, or by a reigning King. Despite this, the tradition of most Ashkenazi Orthodox synagogues is to use Hebrew (usually Ashkenazi Hebrew) for all except a small number of prayers, including the Aramaic Kaddish ("holy"), and the notable Gott Fun Avraham, which was written in Yiddish. In other streams of Judaism there is considerable variability: Sephardic communities may use Ladino or Portuguese for many prayers; Conservative synagogues tend to use the local language to a varying degree; and at some Reform synagogues almost the whole service may be in the local language. Maimonides (Mishneh Torah, Laws of Prayer 1:4) relates that until the Babylonian exile, all Jews composed their own prayers. After the exile, however, the sages of the time (united in the Great Assembly) found the ability of the people insufficient to continue the practice, and they legendarily composed the main portions of the siddur, such as the Amidah, from which no fragments survived. The origins of modern Jewish prayer were established during the period of the Tannaim, "from their traditions, later committed to writing, we learn that the generation of rabbis active at the time of the destruction of the Second Temple (70 CE) gave Jewish prayer its structure and, in outline form at least, its contents." This liturgy included the twice-daily recitation of the Shema, the Amidah, or Shmoneh Esrei, including 18 blessings recited several times daily, and the public recitation of the Torah in installments. The oldest prayer books date from the time of the Geonim of Babylonia; "some were composed by respected rabbinic scholars at the request of far-flung communities seeking an authoritative text of the required prayers for daily use, Shabbat, and holidays." Over the last two thousand years, the various branches of Judaism have resulted in small variations in the Rabbinic liturgy customs among different Jewish communities, with each community having a slightly different Nusach (customary liturgy). The principal difference is between Ashkenazic and Sephardic customs, although there are other communities (e.g., Yemenite Jews, Eretz Yisrael), and rather recent liturgical inventions such as Hassidic, Chabad, Reform and other communities also have distinct customs, variations, and special prayers. The differences are quite minor compared with the commonalities. The idea that a Jew should not change his Nusach Tefillah and has to continue to pray in the way of his forefathers is an invented Halacha of the galut (diaspora, "scattering, dispersion"). According to halakha, a Jew may change his nusach tefilla at any time, even on a daily basis. The earliest parts of Jewish prayer are the Shema Yisrael ("Hear O Israel") (Deuteronomy 6:4 et seq), and the Priestly Blessing (Numbers 6:24–26), which are in the Torah. A set of eighteen (currently nineteen) blessings called the Shemoneh Esreh or the Amidah (Hebrew, "standing [prayer]"), is traditionally ascribed to the Great Assembly in the time of Ezra, at the end of the Biblical period. The name Shemoneh Esreh, literally "eighteen", is an historical anachronism, since it now contains nineteen blessings. It was only near the end of the Second Temple period that the eighteen prayers of the weekday Amidah became standardized. Even at that time their precise wording and order was not yet fixed, and varied from locale to locale. It was not until several centuries later that the prayers began to be formally fixed. By the Middle Ages the texts of the prayers were nearly fixed, and in the form in which they are still used today. The earliest existing codification of the prayerbook was drawn up by Rav Amram Gaon of Sura, Babylon, about 850 CE. Half a century later Rav Saadia Gaon, also of Sura, composed a siddur, in which the rubrical matter is in Arabic. These were the basis of Simcha ben Samuel's Machzor Vitry (11th-century France), which was based on the ideas of his teacher, Rashi. Another formulation of the prayers was that appended by Maimonides to the laws of prayer in his Mishneh Torah: this forms the basis of the Yemenite liturgy, and has had some influence on other rites. From this point forward all Jewish prayerbooks had the same basic order and contents. Conservative services generally use the same basic format for services as in Orthodox Judaism with some doctrinal leniencies and some prayers in English. In practice there is wide variation among Conservative congregations. In traditionalist congregations the liturgy can be almost identical to that of Orthodox Judaism, almost entirely in Hebrew (and Aramaic), with a few minor exceptions, including excision of a study session on Temple sacrifices, and modifications of prayers for the restoration of the sacrificial system. In more liberal Conservative synagogues there are greater changes to the service, with up to a third of the service in English; abbreviation or omission of many of the preparatory prayers; and replacement of some traditional prayers with more contemporary forms. There are some changes for doctrinal reasons, including egalitarian language, fewer references to restoring sacrifices in the Temple in Jerusalem, and an option to eliminate special roles for Kohanim and Levites. The liturgies of Reform and Reconstructionist are based on traditional elements, but contains language more reflective of liberal belief than the traditional liturgy. Doctrinal revisions generally include revising or omitting references to traditional doctrines such as bodily resurrection, a personal Jewish Messiah, and other elements of traditional Jewish eschatology, Divine revelation of the Torah at Mount Sinai, angels, conceptions of reward and punishment, and other personal miraculous and supernatural elements. Services are often from 40% to 90% in the vernacular. In Jewish philosophy and in Rabbinic literature, it is noted that the Hebrew verb for prayer—hitpallel התפלל—is in fact the reflexive form of palal פלל, to judge. Thus, "to pray" conveys the notion of "judging oneself": ultimately, the purpose of prayer—tefilah תפלה—is to transform ourselves. This etymology is consistent with the Jewish conception of divine simplicity. It is not God that changes through our prayer—Man does not influence God as a defendant influences a human judge who has emotions and is subject to change—rather it is man himself who is changed. It is further consistent with Maimonides' view on Divine Providence. Here, Tefillah is the medium which God gave to man by means of which he can change himself, and thereby establish a new relationship with God—and thus a new destiny for himself in life; see also under Psalms. In this view, the ultimate goal of prayer is to help train a person to focus on divinity through philosophy and intellectual contemplation. This approach was taken by Maimonides and the other medieval rationalists. Kabbalah (esoteric Jewish mysticism) uses a series of kavanot, directions of intent, to specify the path the prayer ascends in the dialogue with God, to increase its chances of being answered favorably. Kabbalism ascribes a higher meaning to the purpose of prayer, which is no less than affecting the very fabric of reality itself, restructuring and repairing the universe in a real fashion. In this view, every word of every prayer, and indeed, even every letter of every word, has a precise meaning and a precise effect. Prayers thus literally affect the mystical forces of the universe, and repair the fabric of creation. Hassidism, although incorporating the kabbalistic worldview and its corresponding kavanot, also emphasized straight-forward sincerity and depth of emotional engagement in prayer. The Baal Shem Tov's great-grandson, Rebbe Nachman of Breslov, particularly emphasized speaking to God in one's own words, which he called Hitbodedut (self-seclusion) and advised setting aside an hour to do this every day (Likutei Moharan 2:25). Daven is the originally exclusively Eastern Yiddish verb meaning "pray"; it is widely used by Ashkenazic Orthodox Jews. In Yinglish, this has become the Anglicised davening. The origin of the word is obscure, but is thought by some to have come from Arabic (from diwan, a collection of poems or prayers), French (from devoner, 'to devote' or 'dedicate' or possibly from the French 'devant'- 'in front of' with the idea that the person praying is mindful of before whom they stand), Latin (from divin, 'divine') or even English (from dawn). Others believe that it derives from a Slavic word meaning "to give" (Russian: давать, translit. davat'). Some claim that it originates from an Aramaic word, de'avuhon or d'avinun, meaning 'of their/our forefathers', as the three prayers are said to have been invented by Abraham, Isaac and Jacob. Another Aramaic derivation, proposed by Avigdor Chaikin, cites the Talmudic phrase, "ka davai lamizrach", 'gazing wistfully to the east' (Shab. 35a). Kevin A. Brook, cites Zeiden's suggestion that the word daven comes from the Turkish root tabun- meaning 'to pray', and that in Kipchak Turkish, the initial t morphs into d.
In Western Yiddish, the term for pray is oren, a word with clear roots in Romance languages—compare Spanish and Portuguese orar and Latin orare. Individual prayer is considered acceptable, but prayer with a quorum of ten Jewish adults—a minyan—is the most highly recommended form of prayer and is required for some prayers. An adult in this context means over the age of 12 or 13 (bat or bar mitzvah). Judaism had originally counted only men in the minyan for formal prayer, on the basis that one does not count someone who is not obligated to participate. The rabbis had exempted women from almost all time-specific positive mitzvot (commandments), including those parts of the prayer that cannot be recited without a quorum, due to women in the past being bound up in an endless cycle of pregnancy, birthing and nursing from a very early age. Orthodox Judaism still follows this reasoning and excludes women from the minyan. Since 1973, Conservative congregations have overwhelmingly become egalitarian and count women in the minyan. A very small number of congregations that identify themselves as Conservative have resisted these changes and continue to exclude women from the minyan. Those Reform and Reconstructionist congregations that consider a minyan mandatory for communal prayer, count both men and women for a minyan. All denominations of Judaism except for Orthodox Judaism ordain female rabbis and cantors. In Orthodox Judaism, according to some authorities, women can count in the minyan for certain specific prayers, such as the Birchot HaGomel blessing, which both men and women are obligated to say publicly. Head covering. In most synagogues, it is considered a sign of respect for male attendees to wear a head covering, either a dress hat or a kippa (skull cap, plural kipot also known by the Yiddish term yarmulke). It is common practice for both Jews and non-Jews who attend a synagogue to wear a head covering. Some Conservative synagogues may also encourage (but rarely require) women to cover their heads. Many Reform and Progressive temples do not require people to cover their heads, although individual worshipers, both men and women, may choose to. Many Orthodox and some conservative men and women wear a head covering throughout their day, even when not attending religious services. Tallit (prayer shawl) is traditionally worn during all morning services, during Aliyah to the Torah, as well as during all the services of Yom Kippur. During the daily afternoon and evening services, the hazzan alone wears a tallit. In Orthodox synagogues they are expected to be worn only by men who are halakhically Jewish and though in some Conservative synagogues they should be worn only by men, in other Conservative synagogues both men and women who are halakhically Jewish should wear a tallit. In most Orthodox Ashkenazi synagogues they are worn only by men who are or have been married. Tefillin (phylacteries) are a set of small cubic leather boxes painted black, containing scrolls of parchment inscribed with verses from the Torah. They are tied to the head and arm with leather straps dyed black, and worn by Jews only, during weekday morning prayers. In Orthodox synagogues they are expected to be worn only by men; in Conservative synagogues they are also worn by some women. 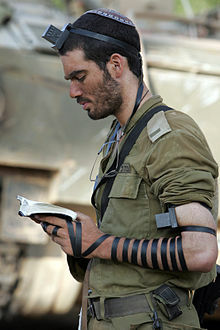 The Karaite Jews, however, do not don tefillin. Various prayers are said upon arising; the tallit katan (a garment with tzitzit) is donned at this time. The tallit (large prayer shawl) is donned before or during the actual prayer service, as are the tefillin (phylacteries); both are accompanied by blessings. The service starts with the "morning blessings" (birkot ha-shachar), including blessings for the Torah (considered the most important ones). In Orthodox services this is followed by a series of readings from Biblical and rabbinic writings recalling the offerings made in the Temple in Jerusalem. The section concludes with the "Rabbis' Kaddish" (kaddish de-rabbanan). The next section of morning prayers is called Pesukei D'Zimrah ("verses of praise"), containing several psalms (100 and 145–150), and prayers (such as yehi chevod) made from a tapestry of Biblical verses, followed by the Song at the Sea (Exodus, chapters 14 and 15). Concluding prayers (see Uva letzion) and Aleinu then follow, with the Kaddish of the mourners generally after Aleinu. Mincha or Minha (derived from the flour offering that accompanied each sacrifice) may be recited from half an hour after halachic noontime. This earliest time is referred to as mincha gedola (the "large mincha"). There is, however, another time to daven mincha, which is then known as mincha ketana (2.5 halachic hours before nightfall). Ideally, one should complete the prayers before sunset, although many authorities permit reciting Mincha until nightfall. Mincha is allowed to be recited during any of the hours between mincha gedola and mincha ketana also. 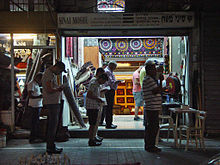 Sephardim and Italian Jews start the Mincha prayers with Psalm 84 and Korbanot (Numbers 28:1–8), and usually continue with the Pittum hakketoret. The opening section is concluded with Malachi 3:4. Western Ashkenazim recite the Korbanot only. Ashrei, containing verses from Psalms 84:5, 144:15 and the entire Psalm 145, is recited, immediately followed by Chatzi Kaddish (half-Kaddish) and the Shemoneh Esreh (or Amidah). This is followed by Tachanun, supplications, and then the full Kaddish. Sephardim insert Psalm 67 or 93, followed by the Mourner's Kaddish. After this follows, in most modern rites, the Aleinu. Ashkenazim then conclude with the Mourner's Kaddish. 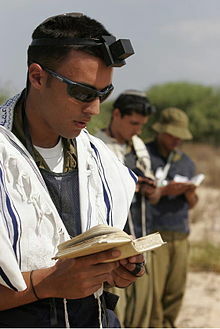 Service leaders often wear a tallit even on normal days, and must wear one during the fast days. On Shabbat (the Sabbath), prayers are similar in structure to those on weekdays, although almost every part is lengthened. One exception in the Amidah, the main prayer, which is abridged. The first three and last three blessings are recited as usual, but the middle thirteen are replaced with a single blessing known as "sanctity of the day," describing the Sabbath. Atypically, this middle blessing is different for each of the prayers. Shabbat services begin on Friday evening with the weekday Mincha (see above), followed in some communities by the Song of Songs, and then in most communities by the Kabbalat Shabbat, the mystical prelude to Shabbat services composed by 16th-century Kabbalists. This Hebrew term literally means "Receiving the Sabbath". In many communities, the piyut Yedid Nefesh introduces the Kabbalat Shabbat prayers. Most commemorate the Shabbat at this point with VeShameru (Exodus 31:16–17). The custom to recite the biblical passage at this point has its origins in the Lurianic Kabbalah, and does not appear before the 16th century. It is therefore absent in traditions and prayer books less influenced by the Kabbalah (such as the Yemenite Baladi tradition), or those that opposed adding additional readings to the siddur based upon the Kabbalah (such as the Vilna Gaon). The middle blessing of the Amidah (see above) discusses the conclusion of the Creation, quoting the relevant verses from Genesis. This is then followed by the hazzan's mini-repetition of the Amidah, Magen Avot, a digest of the seven benedictions (hence it's Hebrew name Achat Me'ein Sheva). In some Ashkenazi Orthodox synagogues the second chapter of Mishnah tractate Shabbat, Bameh Madlikin, is read at this point, instead of earlier. Kiddush is recited in the synagogue in Ashkenazi and a few Sephardi communities. The service then follows with Aleinu. Most Sephardi and many Ashkenazi synagogues end with the singing of Yigdal, a poetic adaptation of Maimonides' 13 principles of Jewish faith. Other Ashkenazi synagogues end with Adon `olam instead. Shabbat morning prayers commence as on week-days. Of the hymns, Psalm 100 (Mizmor LeTodah, the psalm for the Thanksgiving offering), is omitted because the todah or Thanksgiving offering could not be offered on Shabbat in the days of the Temple in Jerusalem. Its place is taken in the Ashkenazi tradition by Psalms 19, 34, 90, 91, 135, 136, 33, 92, 93. Sephardic Jews maintain a different order, add several psalms and two religious poems. The Nishmat prayer is recited at the end of the Pesukei D'Zimrah. The blessings before Shema are expanded, and include the hymn El Adon, which is often sung communally. The intermediary benediction of the Shacharit Amidah begins with Yismach Moshe and discusses Moses' receiving of the Torah (which according to tradition took place on the morning of the Sabbath). Kedushah, which is always recited during the Hazzan's repetition of the third blessing, is significantly expanded. After the repetition is concluded, the Torah scroll is taken out of the Ark in a ritual much longer than the ritual during the week, and the weekly portion is read, followed by the haftarah. After the Torah reading, three prayers for the community are recited. Two prayers starting with Yekum Purkan, composed in Babylon in Aramaic, are similar to the subsequent Mi sheberakh, a blessing for the leaders and patrons of the synagogue. The Sephardim omit much of the Yekum Purkan. Prayers are then recited (in some communities) for the government of the country, for peace, and for the State of Israel. After these prayers, Ashrei is repeated and the Torah scroll is returned to the Ark in a procession through the Synagogue. Many congregations allow children to come to the front in order to kiss the scroll as it passes. In many Orthodox communities, the Rabbi (or a learned member of the congregation) delivers a sermon at this point, usually on the topic of the Torah reading. The Musaf service starts with the silent recitation of the Amidah. The middle blessing includes the Tikanta Shabbat reading on the holiness of Shabbat, and then by a reading from the biblical Book of Numbers about the sacrifices that used to be performed in the Temple in Jerusalem. Next comes Yismechu, "They shall rejoice in Your sovereignty", and Eloheynu, "Our God and God of our Ancestors, may you be pleased with our rest" (which is recited during all Amidahs of the Sabbath. Kedushah is greatly expanded. After the Amidah comes the full Kaddish, followed by Ein keloheinu. In Orthodox Judaism this is followed by a reading from the Talmud on the incense offering called Pittum Haketoreth and daily psalms that used to be recited in the Temple in Jerusalem. These readings are usually omitted by Conservative Jews, and are always omitted by Reform Jews. Mincha commences with Ashrei (see above) and the prayer Uva letzion, after which the first section of the next weekly portion is read from the Torah scroll. The Amidah follows the same pattern as the other Shabbat Amidah prayers, with the middle blessing starting Attah Echad. The week-day Ma'ariv is recited on the evening immediately following Shabbat, concluding with Vihi No'am, Ve-Yitten lekha, and Havdalah. The services for the three festivals of Pesach ("Passover"), Shavuot ("Feast of Weeks" or "Pentecost"), and Sukkot ("Feast of Tabernacles") are alike, except for interpolated references and readings for each individual festival. The preliminaries and conclusions of the prayers are the same as on Shabbat. The Amidah on these festivals only contains seven benedictions, with Attah Bechartanu as the main one. Hallel (communal recitation of Psalms 113-118) follows. In the event one of the prayers was missed inadvertently, the Amidah prayer is said twice in the next service—a procedure known as tefillat tashlumin. Many are accustomed to giving charity before, during (especially during Vayivarech David) or after prayer, in the hopes that this will make their prayer more likely to be heard. Men are obligated to perform public prayer three times a day with additional services on Jewish holidays. According to Jewish law, each prayer must be performed within specific time ranges (zmanim), based on the time that the communal sacrifice the prayer is named after would have been performed in the days of the Temple in Jerusalem. According to the Talmud women are generally exempted from obligations that have to be performed at a certain time. Orthodox authorities have generally interpreted this exemption due to women's higher spiritual level and therefore a lack of need to connect to God at specific times, since they are always connected to God. 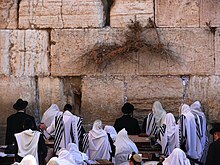 In accordance with the general exemption from time-bound obligations, most Orthodox authorities have exempted women from performing evening prayers (Maariv), but most believe that women are obligated to pray Shacharit and Mincha, the morning and afternoon prayers, respectively, when possible. According to the Mishna, women are exempt from the morning and evening Shema. Orthodox authorities have been careful to note that although some women with small children have been exempted from praying at specific fixed times, they are not exempted from the obligation of prayer itself. The 19th-century posek Yechiel Michel Epstein, author of the Arukh HaShulkhan, notes: "Even though the rabbis set prayer at fixed times in fixed language, it was not their intention to issue a leniency and exempt women from this ritual act". Traditionally women were also reciting individual tkhine prayers in Yiddish. Authorities have disagreed on the minimum amount that women's prayer should contain. Many Jewish women have relied on an idea expressed by(Ashkenazi) Rabbi Avraham Gombiner in his Magen Avraham commentary on the Shulkhan Arukh, and more recently the (Sephardi) Rabbi Ovadia Yosef (Yabiah Omer vol. 6, 17), that women are only required to pray once a day, in any form they choose, so long as the prayer contains praise of (brakhot), requests to (bakashot), and thanks of (hodot) God. However, most Orthodox authorities agree that women are not completely exempt from time-bound prayer. The Mishnah Berurah by Rabbi Yisrael Meir Kagan, an important code of Ashkenzic Jewish law, holds that the Men of the Great Assembly obligated women to say Shacharit (morning) and Minchah (afternoon) prayer services each day, "just like men". The Mishnah Berurah also states that although women are exempt from reciting the Shema Yisrael, they should nevertheless say it anyway. Nonetheless, even the most liberal Orthodox authorities hold that women cannot count in a minyan for purposes of public prayer. Throughout Orthodox Judaism, including its most liberal forms, men and women are required to sit in separate sections with a mechitza (partition) separating them. Historically, a learned woman in the weibershul (women's section or annex) of a synagogue took on the informal role of precentress or firzogerin for the women praying in parallel to the main service led in the men's section. Conservative/Masorti Judaism permits mixed seating (almost universally in the United States, but not in all countries). All Reform and Reconstructionist congregations have mixed seating. Because women were required to perform certain korbanot (sacrifices) in the Temple in Jerusalem, women today are required to perform, and hence can lead (and can count in the minyan for if required), the specific prayers substituting for these specific sacrifices. Birchat Hagomel falls in this category. A very small number of Modern Orthodox congregations accept some such arguments, but very few Orthodox congregations or authorities accept all or even most of them. Many of those who do not accept this reasoning point to kol isha, the tradition that prohibits a man from hearing a woman other than his wife or close blood relative sing. JOFA refers to congregations generally accepting such arguments as Partnership Minyanim. On Shabbat in a Partnership Minyan, women can typically lead Kabbalat Shabbat, the P'seukei D'Zimrah, the services for removing the Torah from and replacing it to the Ark, and Torah reading, as well as give a D'Var Torah or sermon. The first Orthodox Jewish women's prayer group was created on the holiday of Simhat Torah at Lincoln Square Synagogue in Manhattan in the late 1960s. Ephraim Mirvis, an Orthodox rabbi who serves as the Chief Rabbi of the United Hebrew Congregations of the Commonwealth, supports Shabbat prayer groups for Orthodox women, saying, "Some of our congregations have women prayer groups for Friday night, some Saturday mornings. This is without women reading from the Torah. But for women to come together as a group to pray, this is a good thing." In most divisions of Judaism boys prior to Bar Mitzvah cannot act as a Chazzen for prayer services that contain devarim sheb'kidusha, i.e. Kaddish, Barechu, the amida, etc., or receive an aliya or chant the Torah for the congregation. Since Kabbalat Shabbat is just psalms and does not contain devarim sheb'kidusha, it is possible for a boy under Bar Mitzvah to lead until Barechu of Ma'ariv. As well, the conclusion of the service on Shabbat and Chagim may be led by children. Under the Moroccan, Yemenite, and Mizrachi customs, a boy under bar mitzvah may lead certain prayers, read the Torah, and have an aliyah. It is customary among many Ashkenazim to have children sing "Adon 'Olam" after Mussaf and "Yigdal" after Shabat and Holiday Maariv. Among Sefardim, Mizrachim, Yemenites, and some Askenazim, a child leads the congregation in Kriyat Shema. ^ a b Steinsaltz, Adin (2000). A guide to Jewish prayer (1st American paperback ed.). New York: Schocken Books. pp. 26 ff. ISBN 978-0805211474. Retrieved 25 April 2016. ^ Bar-Hayim, David (Rabbi, Posek). "Women and Davening: Shemone Esre, Keriyath Shema and Birkoth HaShahar". machonshilo.org. כל הזכויות שמורות ל. Retrieved 25 April 2016. ^ a b “'Anshei Knesset HaGedolah' – Men of the Great Assembly; founded by Ezra in approximately 520 B.C.E. ; instituted the “Shemoneh Esray” Prayer (recited at least three times a day, and ultimately to serve as a substitute for the Temple sacrifices), and the enacting of many laws to protect and bolster the observance of the Torah commands.” ~ OU Staff. "Anshei Knesset HaGedolah". www.ou.org/judaism-101/. Orthodox Union – February 7, 2014. Retrieved 16 February 2015. ^ Reif, Stefan C. (19–23 January 2000). "The Second Temple Period, Qumran Research and Rabbinic Liturgy: Some Contextual and Linguistic Comparisons". Fifth Orion International Symposium LITURGICAL PERSPECTIVES: PRAYER AND POETRY IN LIGHT OF THE DEAD SEA SCROLLS. The Orion Center for the Study of the Dead Sea Scrolls and Associated Literature. Retrieved 11 March 2009. ^ Center for Judaic Studies, University of Pennsylvania. "Jewish Liturgy: The Siddur and the Mahzor". Retrieved 12 March 2009. ^ a b Bar-Hayim, David. "Not Changing Nusach Tefillah - An Invented Halacha". Machon Shilo. Machon Shilo. Retrieved 4 October 2017. ^ a b Bar-Hayim, David. "What is the Proper Nusach Tefillah?". Machon Shilo. Machon Shilo. Retrieved 4 October 2017. ^ a b "Not Changing Nusach Tefillah - An Invented Halacha- Interview with Rabbi David Bar-Hayim". supermp3song.net. mp3xyz.co. Retrieved 4 October 2017. ^ Mishneh Torah, Laws of Prayer 1:1. ^ Bar-Hayim, Ha-Rav David. "Parashath VaYera-Romanticism vs Realism : Bavli vs Yerushalmi". machonshilo.org. Torat Eretz Yisrael. Retrieved 16 February 2015. ^ Bar-Hayim, Ha-Rav David. "Parashath VaYera: Romanticism vs Realism : Bavli vs Yerushalmi". youtube.com. Tora Nation Machon Shilo. Retrieved 16 February 2015. ^ Bar-Hayim, Ha-Rav David. "Parashath Chayei Sarah: Strolling in Nature, Meditating and Praying: Our Forefather Yitzchak". hmachonshilo.org. Torat Eretz Yisrael. Retrieved 16 February 2015. ^ Gurevich, Eliyahu (2010). Tosefta berachot : translated into English with a commentary (Bertrams Print on Demand ed.). [S.l. ]: Lulu Com. pp. 115-. ISBN 978-0557389858. Retrieved 16 February 2015. ^ The daily tefillah ("prayer") is to fulfill the Biblical requirement based on Maimonides' view as above. ^ Mishna Berurah, Laws of Evening Prayers. ^ a b c "Overview: History of Jewish Prayer". Retrieved 12 March 2009. ^ This interpretation is homiletic rather than scholarly, as it is historically more likely that the root meaning of hitpallel is "to seek judgement for oneself", in other words to present a legal pleading. ^ "The Cosmology of the Mitzvot". ^ Green, Arthur et al, Speaking Torah: Spiritual Teachings From Around the Maggid's Table, Jewish Lights, 2013, p.13. ^ Rabbi Dr Raymond Apple. "OzTorah – Where does "Daven" come from – Ask the Rabbi". Retrieved 20 May 2013. ^ David Curwin. "Balashon – Hebrew Language Detective: daven". Retrieved 9 December 2007. ^ Jewish Women's Archive. Cantors: American Jewish Women. Retrieved 2015-05-07. ^ Jewish Virtual Archive. A History of Women's Ordination as Rabbis. Retrieved 2015-05-07. ^ International Council of Christians and Jews, Jewish-Christian Relations :: A glossary of terms used in the Christian-Jewish dialogue, "Non-Jewish male visitors to the synagogue are offered skull caps at the entrance and are asked to wear them." ^ Rabbi Amy R. Scheinerman, What's What?, "Non-Jews who are guests in a synagogue can cover their heads; it is a sign of respect and not at all inappropriate for people who are not Jewish." Mordechai Becher, Gateway to Judaism: The What, How, And Why of Jewish Life, Mesorah Publications, 2005, p. 328. Joyce Eisenberg, Ellen Scolnic, Dictionary of Jewish Words, Jewish Publication Society, 2006, p. 166. 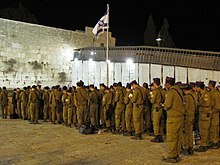 ^ In strict law, one should only recite Mincha between sunset and nightfall if one recites Arvit after nightfall; conversely one should only recite Arvit between sunset and nightfall if one recites Mincha before sunset; in other words one should not take advantage of both flexibilities at once so as to combine the prayers. The prevailing practice, of doing exactly that, is regarded as an emergency measure. On yet another view, the disputed period is not that between sunset and nightfall but the last seasonally adjusted hour and a quarter before sunset. ^ One reason for this is that, while the prevailing practice may satisfy the law concerning the timing of Arvit in the sense of the evening Amidah, it means that the evening Shema is recited too early. ^ "Women's Tefillah Movement – Jewish Women's Archive". Kavvana: Directing the Heart in Jewish Prayer, Seth Kadish, Jason Aronson Inc. 1997. ISBN 0-7657-5952-7. This page was last edited on 18 April 2019, at 01:55 (UTC).